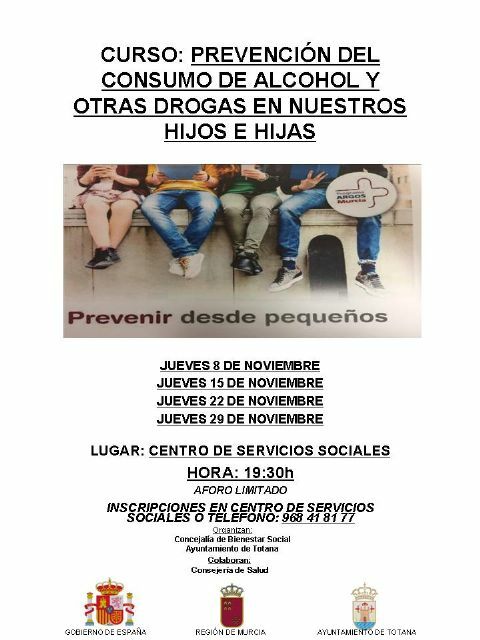 The Department of Social Welfare of the City of Totana, through the Municipal Program for the Prevention of Drug Addiction, is offering the course entitled "Prevention of alcohol and other drug use in our children", which has the support of the Ministry of health. The course, which will take place every Thursday of the month of November (7:30 p.m.) in the Municipal Social Services Center of Totana, requires prior registration in the aforementioned center (Calle Real) or through telephone number 968-418177. that the capacity is limited. In this way, the talks of the course will be on Thursday 8, 15, 22 and 29 November.